Americans who attend a Protestant worship service the week of July Fourth are likely to get a good dose of God and country. Six in 10 Protestant pastors (61 percent) say it’s important for July Fourth worship services to incorporate patriotic elements to celebrate America, according to a survey by Nashville-based LifeWay Research. And while they plan to celebrate the birth of the nation, more than half (53 percent) agree their congregation sometimes seems to love America more than God. Most of the 1,000 Protestant pastors surveyed say their church will change its worship service to acknowledge America’s Independence Day. Two-thirds (66 percent) plan to include special music honoring America. Sixty-two percent each say they will recognize living veterans and those with family currently serving in the armed forces. Fifty-three percent will recognize families who have lost loved ones in service to our country. A third of pastors (34 percent) say they plan to include other special ceremonies to honor America. LifeWay Research found pastors 65 and older are more likely to say it’s important to incorporate patriotic elements in worship services the week of July Fourth (78 percent) than pastors 18-44 years old (44 percent). Pastors in the West (67 percent) are more likely to hold that view than pastors in the Northeast (55 percent) and Midwest (54 percent). Denomination also plays a role in pastors’ views on the importance of patriotic elements in worship services around the July Fourth holiday. Pentecostals (82 percent) are most likely among Protestant pastors to agree on their importance, while Baptists (67 percent) are more likely to agree than Lutherans (51 percent), Methodists (50 percent) and Presbyterian/Reformed (47 percent). Seven in 10 pastors (72 percent) say it’s important for July Fourth worship services to recognize military veterans and current service members. On this issue, race as well as age and denomination relates to pastors’ views. African-American pastors are more likely to say it’s important to recognize veterans and current service members (90 percent) than are white pastors (70 percent). Pastors 65 and older are more likely to agree (79 percent) than pastors 18-44 years old (66 percent). Pentecostals (92 percent) are most likely to hold that view in comparison to Baptists (78 percent), Christian/Church of Christ (63 percent), Methodists (65 percent) and Presbyterian/Reformed (59 percent). Researchers discovered regional differences when asking pastors if their congregation’s love for America sometimes seems greater than its love for God. Pastors in the South (59 percent) are more likely to agree than pastors in the Midwest (51 percent) and West (42 percent). Age also plays a role. Pastors 18-44 years old (59 percent) are more likely to hold that view than those 55-64 years old (50 percent) or 65 and older (49 percent). Patriotism in church doesn’t end after the Fourth of July. A majority of pastors (74 percent) believe it’s appropriate to display the American flag in worship services throughout the year. For more on the study, visit LifeWayResearch.com. 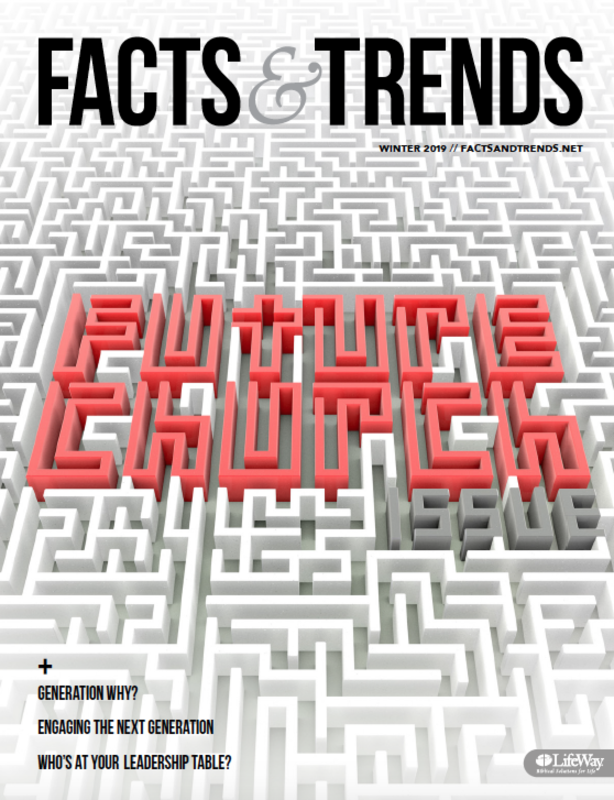 CAROL PIPES (Carol.Pipes@LifeWay.com) is editor of Facts & Trends.